You are here: Home › Acrylics › Application › Artist Resources › Color › Primers and Grounds › Surface Preparation › Becoming Familiar with Color Pouring Medium Matte: It’s More Than Just for Pours! GOLDEN Color Pouring Medium Matte (CPM Matte) is a very new and exciting product for 2019. Unlike most acrylic mediums that develop an initial “skin” when drying, this medium avoids skinning over and therefore is quite resistant to “crazing”. The added benefit is this process allows for air bubbles and tool marks to readily disappear. 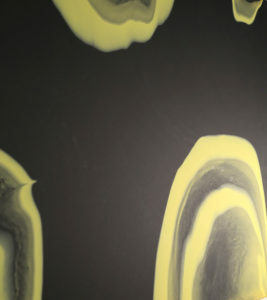 A close-up image of the surface of a CPM Matte painting, with drizzled black lines merged into Quinacridone/Nickel Azo Gold. 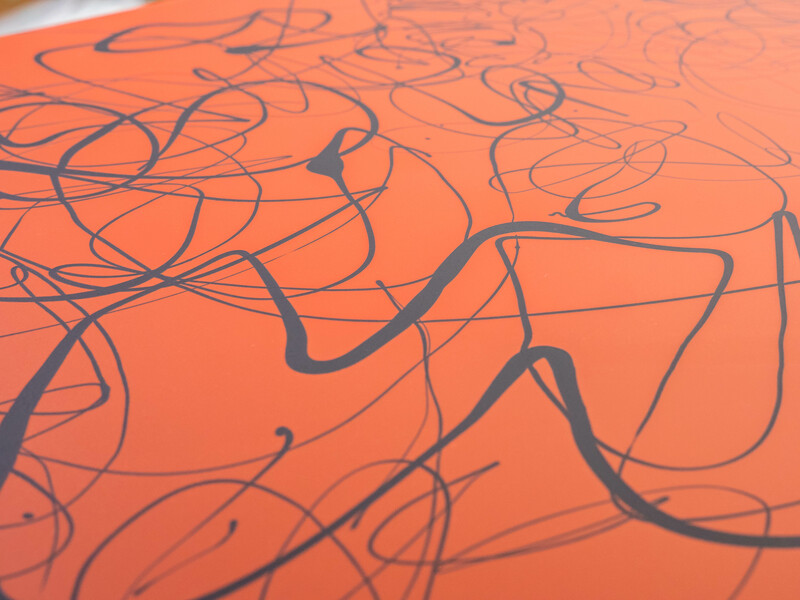 In regards to pouring, craze-resistance is important and practical, and it allows more freedom while painting. CPM Matte levels well, creating smooth, uniform paint layers. It can be blended with Heavy Body, Fluid, or High Flow Acrylics as desired, although starting with relatively low levels of paint (around 10% color) until you gain some experience with the product and its mannerisms is encouraged. The Color Pouring Medium Product Information Sheet has many suggestions to help get you started in the right direction. Just because it’s designed as a “pouring medium” doesn’t necessarily mean that pouring is the only thing you can do with it or that you can only use CPM Matte in an artwork. There are other uses that make CPM Matte a handy tool to keep in the studio, even if pouring isn’t your thing. You can certainly still use brushes and tools to apply mixtures. Below are but a few of the other ways you can work with it. Translucent, ethereal color fields are easy to create with CPM Matte and a small addition of acrylic paint. 1-5% paint amounts are great for generating glazes that are both brush stroke free and smooth to the touch. Tone previous paint layers or establish hazy backgrounds. You may brush or blade (or pour, of course) relatively generous layers and watch the tool marks dissipate as the layer relaxes. The glossy wet surface will first level smoothly, and then dry completely matte and flat. 4’x4′ Color Pouring Medium Matte with Fluid Acrylics. Almost by accident we discovered that combining mica pigment based paints with this product yielded stunningly beautiful effects. Often the pairing of reflective pigments with matte medium results in disappointment. Try Interference Violet over Black Gesso, or Iridescent Silver over a gray base. CPM Matte with Iridescent Silver over grey Gesso still shimmers. Titan Green Pale and Titan Mars Pale HB with CPM Matte on top. If the CPM Matte dries too flat – both in terms of sheen and depth – for your taste, you can modify the medium with Color Pouring Medium Gloss (CPM Gloss). In order to add depth without necessarily creating a glossy paint layer, mix 7 parts CPM Matte with 3 parts CPM Gloss. CPM Matte and Gloss mixed 7 to 3, then blended with Fluid Acrylics. There’s a handy mixing table that lists what each mixture will dry to in our Product Information Sheet. These blends may then be applied as desired with brush, blade and of course right from the mixing container! Additionally, if you find the CPM Matte dries too thin for you, add the CPM Gloss to reduce the amount of shrinking. These combinations also aid the CPM Gloss’ flow and leveling, so experiment with how various mixtures behave and not just on the dried finish. Mix with Gesso to create a Leveling Gesso! If you abhor sanding primed surfaces (like me) to achieve a smooth gesso coat then give this next application a try: Mix GOLDEN Black or White Gesso with the CPM Matte at 1:1 and apply a relatively generous layer and then lay it flat to dry. The result should be a smooth, flat finish ready for painting. It is important to note that smoother substrates (hardboard, M.D.O. plywood, etc) result in a more uniform Gesso/CPM Matte layer. This blend will not smooth out texture like canvas weave when it dries. You’ll need to create a smooth surface first and then use the mixture, or you can apply the CPM Gloss first and then cover with the CPM Matte/Gesso mixture. Allow these primer coats plenty of time to dry well (3 days is ideal) prior to painting. Black Gesso & CPM Matte blended 1:1, then brushed onto hardboard panel. We do a wide array of testing of each product we create here at Golden Artist Colors. Aside from tests to confirm the robustness of the product as a professional artist tool, we further engage in applications testing to push the boundaries of what the products are capable of doing for the artist. As one may suspect, we can’t possibly test every single way one might use a new product. Besides, what fun would it be if we didn’t allow our customers the chance to experience the frontier themselves? However, while testing the Color Pouring Medium Matte, we observed some application anomalies we did want to bring to light to insure artists are aware of them and suggest ways to reduce them (or make them!). It is always valuable when experimenting yourself to test your applications before embarking on important projects. Unsealed supports such as crescent board readily absorb water and other additives in the medium. This may result in “mud-cracking” if the layers are built up thickly. 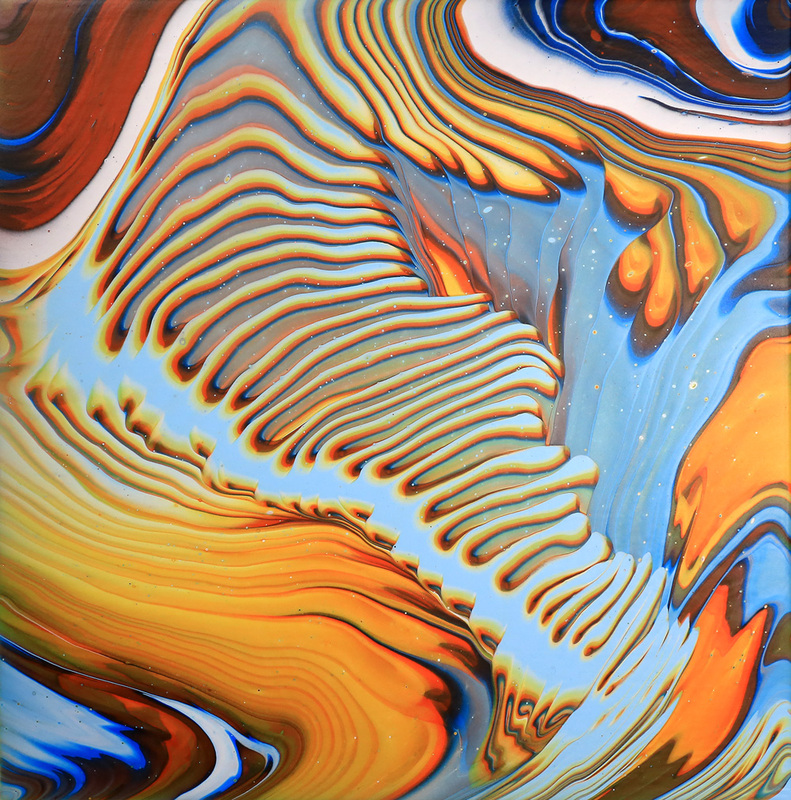 Slow drying, thick puddles of CPM Matte mixtures can develop bubbles under the fresh pour. 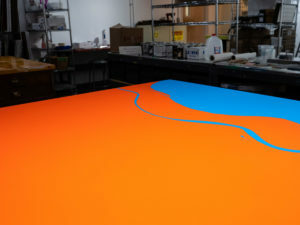 This is more likely to happen on stretched canvases because the weight of the wet product bows the canvas and creates thick paint pools in the center. 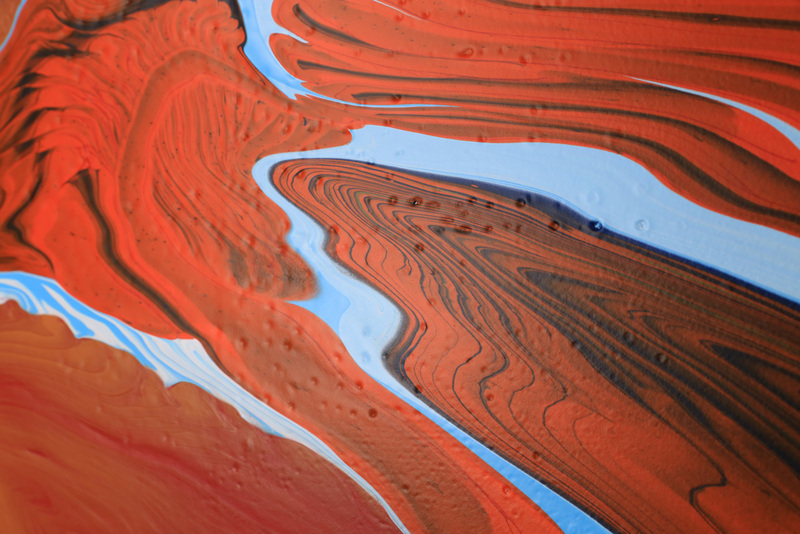 Bubbles, “Mud Cracks” and Crazes can develop when Color Pouring Mediums are applied heavy-handed over highly absorbent surfaces, such as canvas. Sealing the surface and reasonably thick pours greatly reduces these issues. Use a layer or two of thin glossy acrylic to seal the substrate surface before the buildup of CPM Matte layers. Work on a level painting surface. Slight angles will cause the paint to continue to move and create thick edges that dry slower than the rest of the pour. Thick layers dry more slowly than thinner ones, and in turn are more likely to facilitate the generation of surface defects. Tilt the wet pours to “stretch” the product into a thinner pour. Avoid heavy pours unless the excess can flow over the edge later on. Try to limit the number of layers, but if you plan to do many pours on one painting, keep them thin. Support stretched canvases with underlying panels to reduce thick central pools. Allow reasonable drying time between layers of CPMs and before moving onto other types of painting products. Color Pouring Medium Matte offers some amazing benefits for the artist. Uniform, matte layers free of tool marks has been an elusive research goal for a while. We hope you’ll try this product out and show us new ways to use it. Be sure to visit the new Just Paint Experience which will highlight using this product along with sister product: Color Pouring Medium Gloss. 5 Responses to Becoming Familiar with Color Pouring Medium Matte: It’s More Than Just for Pours! thanks for presenting the new Color Pouring Medium Matt. How are the new Color Pouring Mediums compared to gac800? I like the idea that this medium is “self leveling” is very interesting. As an artist on a limited budget the 20:1 ratio sound great except that the cost for a gallon of the medium is not cost efficient to use 20:1. So then the article shows different lesser ratios. If I followed the information sheet correctly the only difference in say 3:1 verses 20:1 is the gloss??? Please Note the link https://www.goldenpaints.com/pdf_viewer?file=https://www.goldenpaints.com/admin/image/get_assets/pigment-density-of-golden-artist-colors.pdf did not work for me. Thank you for your comments. I will ask our IT Department to take a look at the Pigment Density pdf to see if they can understand why it is not working for you. Perhaps you could try viewing the document with a different browser and see if that helps. Regarding the ratio of paint to medium, paint typically costs more than mediums due to expensive pigments and the high pigment levels in our paints. In the case of the 20:1 CPM Matte to paint, this was done to create translucent, glaze-like color layers. You can use a much higher percentage of paint if you desire. We created a previous article that discusses the threshold of paint to medium, which does vary between product lines. If you over add the paint into the pouring medium, the medium is not going to be as effective in how it levels and in the dried glossiness, depending on the type of paint used. How did you get an acrylic medium that doesn’t form a skin? Does it go tacky and then less tacky until totally dry? Does that compromise the paint film? Thank you for your comments. The acrylic medium does form a film but it doesn’t happen initially as most acrylic mediums will. There is enough water and other evaporates in the CPM Matte to allow the layer to shrink and thicken until it starts to form a paint film towards the end of the process. Therefore, it remains wet and workable for quite some time, up until it becomes too thick to have any movement. Soon afterwards the layer dries and becomes matte.